Just as long as our funding may allow, Apprising Ministries continues on among those pioneering the still-developing mission field of online apologetics and discernment ministry (OADM). Sadly, this path has now led to having to write posts like James MacDonald Was A Bit Late In Mainstreaming T.D. Jakes and Perry Noble, Jack Graham, And Quasi-Word Faith Preachers. Where once the labors of OADM works were largely focused upon non-Christian cults we now find ourselves having to warn of growing apostasy spreading throughout the visible church. Ever since the ignominious Elephant Room (ER) of James MacDonald, and his partner in spiritual crime Mark Driscoll, we’ve seen the participants—and their various comrades—uniting. So, for over a year now I’ve been discussing with you what sure appears to me to be a new Evangelical Ecumenical Magisterium (EEM) that’s been growing up around that ER of MacDonald and Driscoll. With this in mind then, let me now bring you around to the video below from leading EEM member Steven Furtick, prophet-leader of the highly influential multi-site megachurch known as Elevation Church. The audio track forms the basis of the video clip to follow. 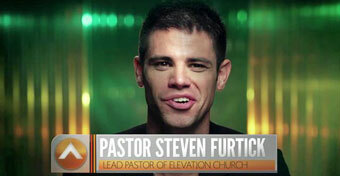 As you might expect from the above, Furtick’s message is straight out of his hybrid evangelical/Word Faith mythology, which I outlined in Steven Furtick Bringin’ On Word faith And The Pastrixes. As you listen to it, I think you’ll also discover that it sounds eerily similar to the Self Help/Word Faith fable that Furtick’s favorite preacher T.D. Jakes always spins. It also reminds me of another of Steven Furtick’s influences, Word Faith Heretic Rod Parsley.